We are rather proud of ‘Friendship of Plymouth’. She is a purpose-built workboat, specially fitted out to carry disabled or able people in safety, comfort and style. She has twin diesel engines and full electronic navigation with GPS chart plotter. She is MCA-certified to commercial standard and has a full set of safety equipment including liferafts, radios, distress flares and first aid kit. She has wheelchair clamps and an easy access ramp for wheelchairs. With all-round guardrails she is a safe platform for anyone to go to sea. We ran a competition for local children to find a name for her – and ‘Friendship of Plymouth’ was their winning choice. Safety on the water is always a top priority for our children’s sailing activities. We could not do this without our powerful RIBs (Rigid Inflatable Boats). They serve as a command boat for Horizons instructors as well as performing general ferry and support duties. When the children are sailing our RIBs are crewed by experienced Skippers and out on the water – in amongst the boats – so that they can respond immediately to any mishaps. 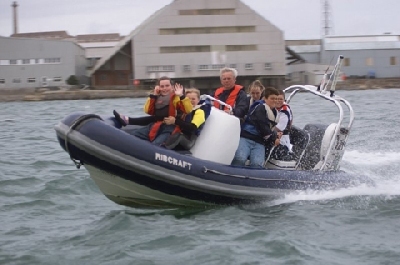 This is our big RIB taking a group of children back to the marina. 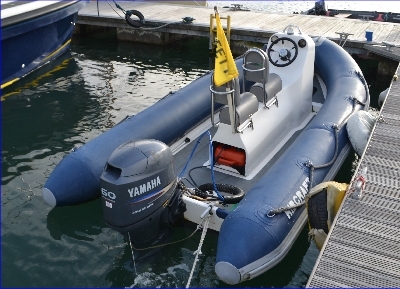 This is our smaller RIB alongside in the marina and ready for duty. This is ‘Jubilee’ attending the scene of a capsized dinghy. The young sailor has already climbed up on the centreboard in preparation to righting the boat on his own, as he has been trained to do. But the RIB always attends to provide safety cover just in case something does not go to plan.